We found Lynn & Ryszard quite by accident. Beba spotted the FIRE AGATE ART STUDIO sign and, not knowing a great deal about Fire Agate, we decided to go in and investigate. The room we entered was radiating with lovely shining stones displaying amazing rainbows of colour. Beba saw an extremely beautiful stone under the glass and asked if we could examine it more closely. As we were admiring the agate, I asked how much it cost. The answer $1700.00. OOOPs can’t afford that one!!! Obviously we did not know enough about the value of Fire Agate. We continued to visit with Lynn and Ryszard and somehow the fact that we were from Vancouver Island was mentioned. To our surprise, Lynn said,”Oh, we are from Bowen Island.” Small World !!!! Ryszard then took us out to where we belonged… in the back with the raw rock. We found our way to the $5.00 and $10.00 buckets!!! Just right!!! Fire Agate, as Ryszard explained is formed as nodules in the pockets of void spaces of volcanic rhyolite. Due to hydrothermal activity a mixture of molten silica and impurities fills the spaces in the rhyolite. Botryoidals (grapelike clusters) form infused with colour. A milky or clear chalcedony cap forms over the Fire Agate safely preserving it. Fire Agate was first documented in the 40’s and 50’s and has a hardness of 6.5-7. Ryszard explained that is a difficult stone to cut due to the colour being trapped in the grape like clusters. He uses Dental drills and bits to follow each nodule, and contour and layer to maintain the grape effect and the colour. He carves dragons and other animals into the small pieces of stone and then designs and makes lovely pieces of jewellery. Ryszard helped us choose some raw pieces which he assured us would make some lovely ring stones. This will be my experiment for the year. When we arrived back at our hotel, I picked up a magazine and there was a huge article about Ryszard . I learned that he is considered the best Fire Agate Artist in North America. Please learn more about Fire Agate and get to know Lynn, Ryszard and their family at www.fireagateartstudio.com. World Gem Society: FIRE AGATE! A most unusual gemstones that is unique in the world. Fire Agate. The very name defines one of the most unique members of the gemstone world found only in the US states of Arizona and California, and in Mexico. This very rare member of the quartz family provides a unique beauty caused by a very unusual combination of geological events. As seen at left and below, fire agate forms as nodules in pockets or void spaces in rhyolite lava flows, according to World Gem Society member and fire agate expert, Ryszard Krukowski of Fire Agate Art Studio. The combination of silica and specific impurities allow the nodules to form in hydrothermal pockets inside the rock. This results in the fire agate nodules forming under a cap layer of milky or clear chalcedony that protects the formation. You can see the nodules in the larger image below. Since fire agate is so unique in formation, every stone offers its own unique combination of colours and beauty. Cutting of fire agate requires experience and knowledge about the stone and its optical properties. Below are a few examples from the World Gem Society collection. They represent a cross section of qualities that you can review for your future purchases. At left you see a fire agate of dominant red colours with little rainbow or peacock colouring. This is a beautiful stone for earth tone jewelry that is very affordable. With a hardness and tenacity of quartz the fire agate is a very long wearing and durable gemstone that is very affordable. Here at left you see a fire agate of medium quality based on our overview. You can see the rainbow colouring in the stone that represents a medium range fire agate. This is a one-of-a-kind gemstone you are seeing that has no equal anywhere in the world. And most important, the fire agates cannot be lab created and cannot be treated due to the formation structure. So every fire agate will be natural and untreated. When Ryszard Krukowski first sent me images of his fire agate my first thought was: "....yeah, Buddy, I have Photoshop too". But when I saw these in person at the last Tucson Gem Show week I realized that these are truly astounding gifts from nature. This fire agate from the Fire Agate Art Studio is exactly as you see at left from the photo taken in the WGS office today. The white colours are lighting reflections from the surface. We did not Photoshop this image in any way. Astounding colours and quality from a master cutter of fire agate. These stones are actually difficult to photograph because of the enormous variety of colours and optical directions of light refraction that takes place inside. Just astounding beauty from an astounding gemstone. We will add a new image of this stone to our World Gem Society Gemstone Directory. Perhaps the most fun with fire agate is the amazing combination of colours and structures you can find in one stone. The images you see at left and below are all of this same stone from Fire Agate Art Studio, hand picked for us by Ryszard Krukowski in Tucson. Exceptional beauty that makes being in this gemstone business fun. Images at left and below are under 90x magnification with our Meiji Techno microscope. 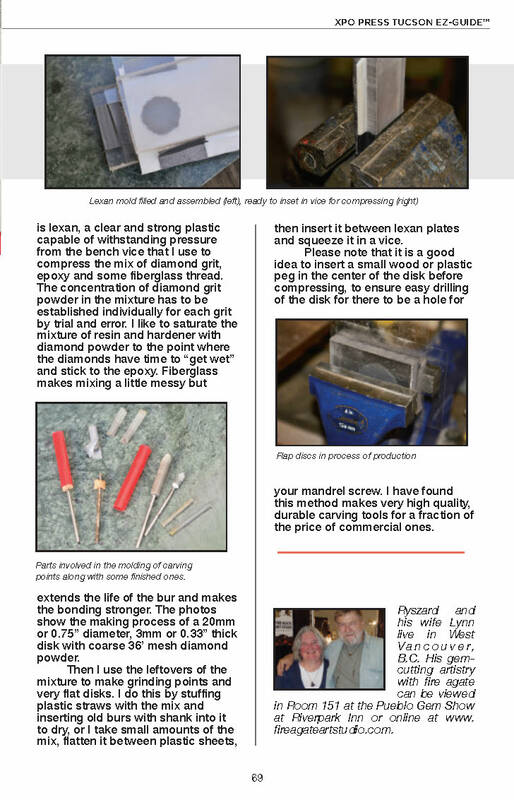 Information in this edition of our newsletter came from the brochure: How to AppraiseAppreciate Fire Agate by Ryszard Krukowski. To obtain a copy please email him at this email: fireagateartstudio@gmail.com or visit their website for more information. To contact us please use the link below and visit the World Gem Society website.